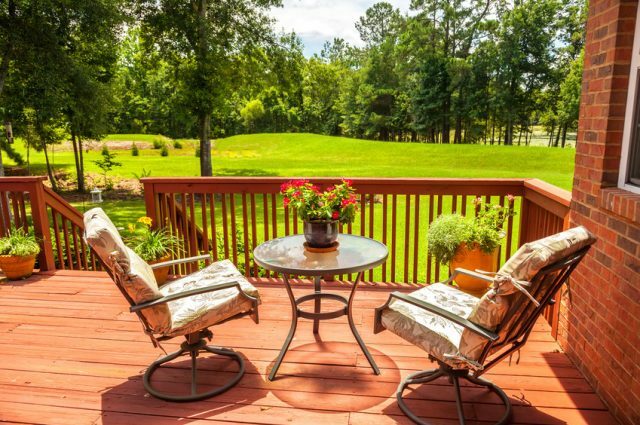 You love entertaining guests on your deck or porch, but you can’t shake the feeling that it’s seen better days. If your outdoor space is like most, those old wooden railings are some of the first things to go, succumbing to rot and mold. Upgrading to a 21st century material like aluminum or vinyl packs a ton of advantages — as well as amazing deck railing colors! Often seen with a shiny black hue, aluminum railings are built strong yet have a slim modern profile. This railing system type accompanies both modern and traditional outdoor living spaces. Westbury Railings, a product that Smucker Fencing is proud to install, comes in 12 different shades, allowing you to select the color that best suits your tastes and your home’s outdoor decor. A bold deck railing color choice that has recently exploded in popularity. Bronze is an in-demand Westbury Railing color as it adds a metallic hue that complements traditional decks and porches. A subtle color that makes for an interesting color complement, Brown-colored aluminum railings can match the gray-shaded deck boards of a modern design or the white wooden boards of a historic front porch. A truly timeless look, White aluminum is one of our favorite choices for updating the wood railings on historic porches and decks. Unlike white painted wooden rails, these will never peel, rot, or deteriorate. Not just a typical black railing, this color takes on the classic deck railing and adds understated elegance to any space. Satin Black is the most popular Westbury railing color — and it’s easy to see why! Vinyl is a smart replacement for old wooden porch and deck railings. Not only does vinyl feature the low-maintenance benefits of aluminum, but it’s also backed by a budget-friendly price point. While White is the most common vinyl railing color, you have more options to create unique color schemes when you choose a vinyl railing. The classic American color choice. When you’re replacing a white-painted wooden porch railing, vinyl lets you upgrade the material, while keeping the color scheme intact. In addition, White is a color that exterior designers love as it matches both modern and historic outdoor spaces. Tan-colored deck railings boast high impact color that you might not have thought of — but once you see it, you’ll love it. Particularly popular on backyard decks and around pools, Tan railings bring a beachside vibe to your backyard. While the natural grain of wood can’t be replicated with vinyl, the earthy color palate can be. Clay or brown porch and deck railings are an effective way to bring a rustic feel to a deck or porch — even when you’re basking in 21st century convenience. While vinyl railings have a nearly unlimited lifespan, they will require some spring cleaning to keep them looking their best. Cleaning vinyl railings is very similar to cleaning a vinyl fence! At Smucker Fencing, we’re known throughout Central PA as the company to trust for all of your fencing and railing needs. In addition to our expert install, we stand out thanks to the wide variety of materials we carry, including a huge range of deck and porch railing colors. 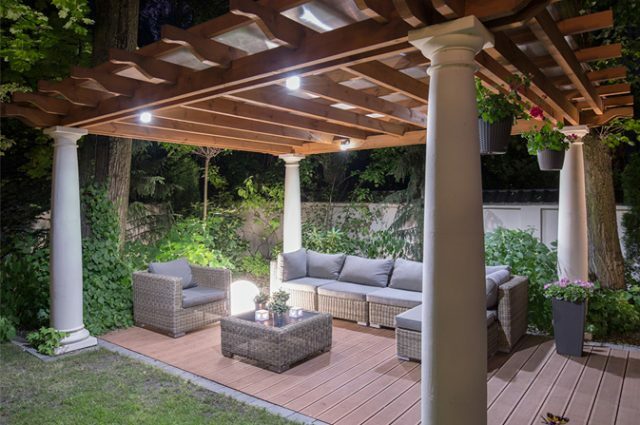 The first step to upgrading your outdoor living space is a conversation with the Smucker Fencing team. Our exterior designers can help you find the right railing color and material — as well as give you a FREE quote.